A recent stop on our tour took me to Stockton, California, where I had two days off to explore the wonders that Stockton has to offer. Turns out, about two hours would’ve sufficed. 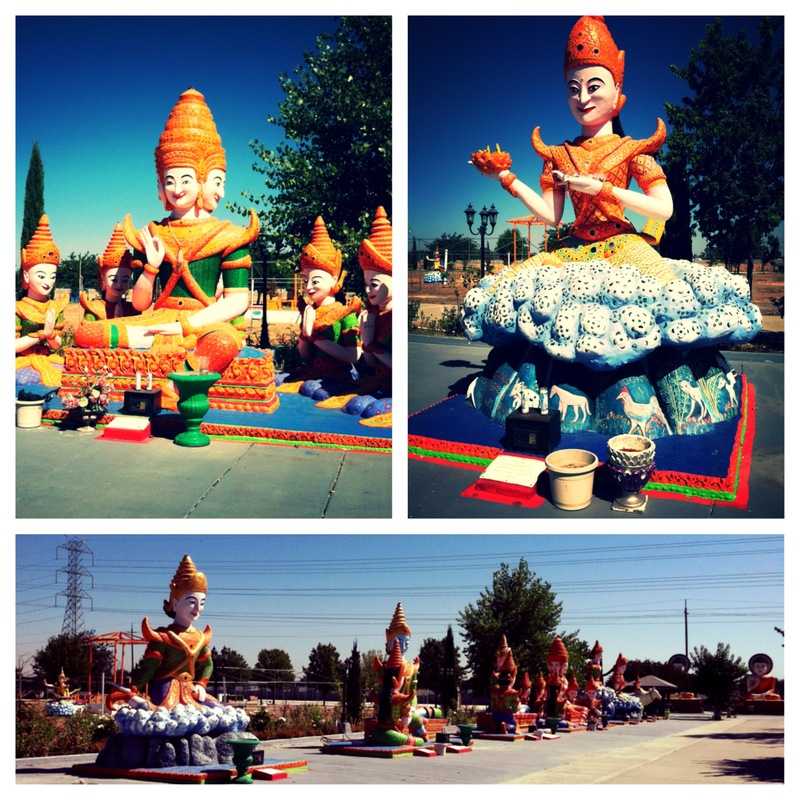 Nonetheless, if you are road tripping through Stockton, one interesting site to see is Stockton’s Cambodian Buddhist Temple (Wat Dharmararam). I’d like to just throw this out there, although it should go without saying, that I am directing you to a religious center and you should show the appropriate amount of respect, regardless of whatever you may believe in, while on their property. Wat Dharmararam is free of charge, although each of their statues has a donation box outside of it. Similar to leaving a dollar for a candle in a Catholic Church, you can leave some cash (or other offerings – fruit and flowers seemed to be popular) at the different statues. Or you can feel free to check out the scene without donating anything. The monks we bumped into there were very chill. Statues from Buddha’s life. From realizing it’s better to be good (and not feed people to crocodiles) to chatting with the king of the Giants (the blue dude in the corner). First and foremost, I recommend you visit this site and print out the meanings of the statues, to get the full experience. As I learned there, this section of the Visit Stockton website won’t load on a mobile phone. If, like me, you neglect to do this, any of the monks will be happy to explain the story to you. The statues tell the story of Buddha, as well as some goddesses. It was a very pleasant half an hour or so strolling among the statues. It didn’t hurt that I had a Buddhist with me who was able to explain what we were looking at. Mostly. Buddhism has several different sects, like other religions, and once in a while he would just shrug and say it must be a Cambodian Buddhist thing (ie. the alligator/crocodiles eating people in a pond and the blue creature talking to Buddha). Whether or not Buddhism is for you, I would highly recommend it as an excellent break in a road trip or just something unique to check out next time your in Stockton, California. 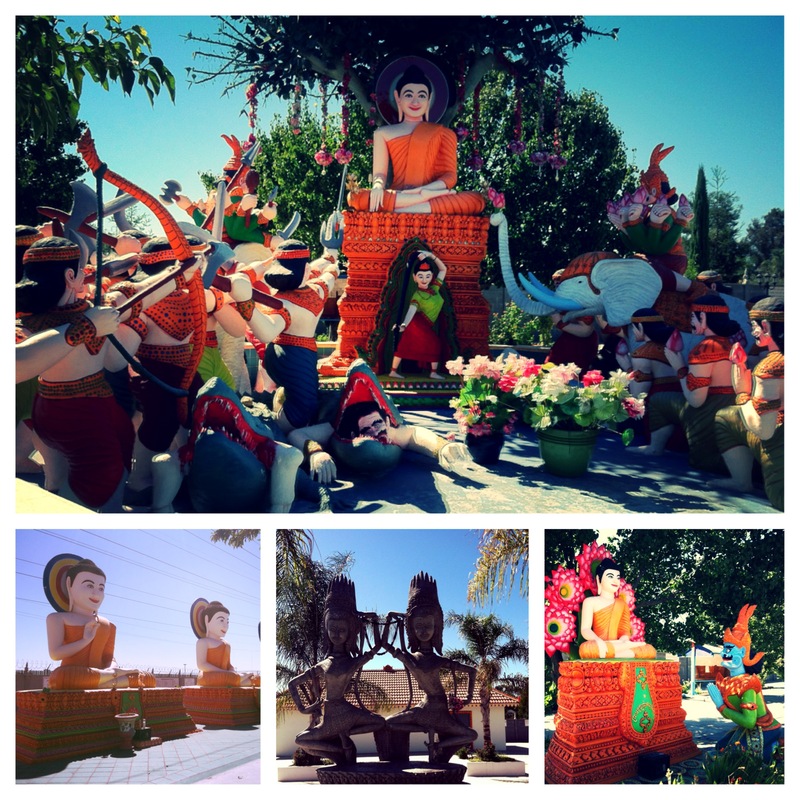 This entry was posted in Roadside Attraction and tagged buddhist temple, budget travel, california, free, roadside, roadside attraction, stockton. Bookmark the permalink.